Before serving, add the avocado, orange juice, green onions, cilantro, jalapeños, olives, peppers and olive oil to the cured fish. Gently toss all ingredients. Add salt and pepper to taste. Cut off the stem of the Iceberg Babies®, rinse under cold water, and allow to drip-dry completely. Separate into individual leaves creating five or six lettuce leaf cups. Chiffonade the remaining lettuce. Arrange the cups on the serving plate in an open circle. Fill each cup with the lettuce chiffonade and top with two full tablespoons of seviche. 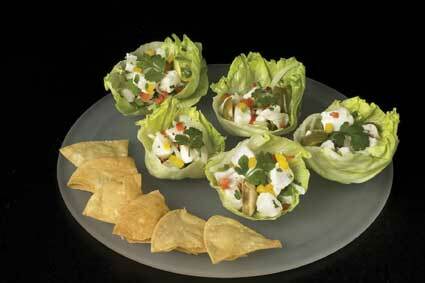 Chef’s Comments: Iceberg Babies® work well for this South-of-the-Border favorite, perfect for a buffet dinner party.